I would like to let you know how much I appreciate the work done on my photos and the timely manner you got them back to me. ScanMyPhotos offers a wonderfully seamless process for digitizing images that have been dormant for many years and bringing them back to life. We scanned photos through you previously and had a great experience. Now buying boxes for the rest of our family! I sent my photos to ScanMyPhotos.com and they were recently returned. I just have to tell you what I am sure you already know — you all do a fantastic job and really do perform an invaluable service preserving America’s photographic heritage. All those Brownie photos, all those faded photos and all the pre-digital images of our family’s heritage are now safe and able to be shared with other family members. And many have now been printed and framed and are able to be displayed in my home. The warm memories have been flooding back. So I will next tackle 8 carousels of slides and prepare those to be sent to you. I have told everyone who will listen that they should send their photos to ScanMyPhotos.com because the story of their life is too important not to preserve. Please tell everyone there to keep up their good work and careful handling of our memories. Thank you for your role in leading such an impressive company. @KatieFloyd Great place to scan photos quickly and efficiently in US is @ScanMyPhotos. Have used them multiple times. I just want to thank you for your very nice, informative and instructional email on how to rectify the mis-interpretation and lack of paperwork on my part. I really appreciate the time and effort, you put forth to provide this to me. This type of customer service is seldom found in these days of automation and "let the buyer beware" attitude of company's. It was very refreshing to see this service still exists. Thank you again, and have a wonderful day. Your service is professional, organized, and fast. I appreciate the email confirmations that you received an order, then shipped an order. My photos have arrived back to me neatly banded together just as I sent them to you. Thank you very much for the care your company takes in scanning my photos. I was nervous to send them. Now – just want to recommend your company to everyone I know. Downsizing my old photo albums onto CD/DVDs, and used http://t.co/1UVDxpSp. They did a pretty nice job. I want to compliment your company on an excellent job on my [recent order]. I was nervous about sending off so many precious photos of my now grown daughters and while I read good things, I also read a few complaints about quality. The quality has far exceeded my expectations and I am thrilled. I speak as the former owner of a professional wedding and portrait studio. The colors are better than many of the photos that I sent in and they are sharp and dimensional. I will be spreading the good word and will use your company for future projects involving photos. I received my scanned slides today and I am ecstatic! They are wonderful. I want to thank you and your technicians for such a wonderful job. I had a total of 828 slides done and they are now safe on DVD. There are almost 50 years of memories. I have used your services for many, many photos and slides. I am very pleased with the results. Just went though my photos! Great work and thank you! I placed an order with you last year for 2000 scanned photos. I really really happy with my scans. Just received my second batch. Again, happy with my order. Thanks! my dad just used scanmyphotos.com to digitize 1000+ of our old family photos. He said it was easy. Thanks again for excellent service; the 600 DPI scans are great (I sent in a bunch of new pix from my in-laws, and filled the box with pix of mine that you scanned at 300 DPI in 2009 -- the difference is clear). Really impressed with @scanmyphotos.com service. They've helped me organize my life and did it in a high-quality way! We just received our order from you. WOW!! We are so impressed! Thank you so much for putting our precious memories in a useable and safe format for us. The photo book with all 1858 thumbnails (upright, in order, group, enhanced, etc.) was just the delicious icing on the cake! Can't thank you enough. Had a great experience with @scanmyphotos. Digitized 2K old snapshots. Happily viewing them on iPad and TV. I CAN'T WAIT TO SCAN ALL MY CHILDHOOD AND HIGH SCHOOL PHOTOS!!! Such a great idea! I received my order today. THANK YOU. Your service is professional and prompt. Your people were helpful. The instructions are clear, well-written and understandable. I will definitely recommend your services and will be using your services again in the very near future. Please extend my thanks to your hard working staff. nice new website! Nice place to go and digital my memories! I was really surprised by the quality of the scanning, even with odd sizes and imperfect condition! Great turnaround time! Everything was great. Your instructions were clear and easy to follow. When I had a question the person who answered was polite, clear and helpful. I've already recommended your service to others. I was extremely impressed. I will definitely use your service again and will recommend to friends whenever they need your service. Thanks again for your prompt service. There is a company in Irvine, California, who will take all your old pictures and scan them for you – cheap, fast, and relatively hassle-free. This was a gift sent from heaven for someone like me. Just the peace of mind is worth every penny to me. Your old paper pictures are irreplaceable and for me, at least, they meant a lot to me. I had my very few baby pictures, pictures of my parents wedding, pics of my children when they were first born, and lots of pictures of relatives that are long gone now. I wanted to be sure those pictures were going to be safe. I am *so happy* with the results... I've got digital shots at my fingertips. These pictures have been stashed away in boxes and photo albums for years, and they're finally getting the "face time" that they deserve! starting another big project with scanmyphotos.com. fantastic service and great way to go digital. Thank you! I had another box ordered and found out how PRICELESS your service is!! And how wonderful to pass down to my children!! THANK YOU ! I just received my scanned photos. What a great service you provide at a very reasonable cost. I sent about 4000 prints on a Friday and received them and the scanned images back (in Ohio) the following Friday. I sent in 947 prints and received them back within 5 days. They were so fast! Everything was organized and packaged very well so as not to harm my photos. The disc contained everything. The scans were very nice and easy to view and organize. ScanMyPhoto handled everything in a very professional way and the guidelines were very simple and easy to follow. I am so grateful! Now I have six years worth of photos that I can use to create photo books for my family. Thank you! I brought in @800 photos to be scanned and they asked if I wanted to come back in an hour. Thats fast! and the price was great. Now I can share them with the family online. Phenomenal service. Just received my 983 photos back with companion DVD all for $65 plus shipping. Best deal (quality and price) out there. Thank you! Just a note to thank you and your staff for the excellent work and timing for our family with the video. We are having two memorials for my husband and everything came in in time for us to process with our Church. Thank you again for all you have done and also for the book of pictures of my guy of 46 years!! Thank you so much for the great service (everything got here before Christmas!! ), and the real spirit behind our company. Next: the wedding photos in the big box!! I used#scanmyphotos to scan a few thousand old prints. Great! If you're thinking about doing it yourself, don't! If one of your NY resolutions is to organize old photos, [ScanMyPhotos.com] will help. I ordered the Premier Legacy package over a year ago, & it WAY fulfilled my expectations. My husband's folks passed away a few years ago, & hubby had a box of photo albums & loose photos from their house. Some really great old photos were in Siberia, so to speak. And the childhood photos were particularly important, because 2 of his 3 siblings died young: 1 in 20's, 1 around 50. So, yes, I had no idea how long it would take me to carefully remove most of the photos from their old & yellowing albums, but over the course of about 18 months, I did it! And you were kind enough to give me a little leeway on the year deadline, which I really appreciated, given my trouble with my hands. SO, hubby received a truly wonderful, total SURPRISE gift this past Christmas: the disk & "memory album." Wow. He was really moved, and he is not a wildly expressive guy. This gift really means something to him, & I know it will to our daughter someday (although she also enjoys it now). And, three of the five included disks are on their way: 1 to his dear cousin, battling cancer, 1 to his remaining sibling, and 1 to the child of one of his deceased siblings. We're filling another box, sending it soon and telling all our friends. I wish everything in the world worked as well as ScanMyPhotos.com! My scanned photos turned out beautifully, and the turnaround was mindblowingly fast! You have no idea how much of a relief it is to have these images converted to digital. It's been something I've been meaning to do forever, but the thought of doing it myself has been terrifying. Thank you so much, ScanMyPhotos! I'm a forever fan. You did a fabulous job with our previous order of 15 years of prints turned into one disc! Thank you, and we look forward to completing our prints with this new order. Good work! If you need all your old photos scanned and put on cd, use @ScanMyPhotos. They do an amazing job. Good prices, too. @ScanMyPhotos you did an AMAZING job on our old family photos, particularly the "photo soap" work on the yellowed, vintage snapshots. You may be tempted to balk at paying for scanning but ask yourself how much you spent developing all those pictures in the first place. It is wasted money if you can't find the photo you want. And scanning them on a home scanner would take a lifetime. Had a great experience with this service. Good quality, very fast and reliable. Lightening Fast turn around. Thanks for the quick service and low price - I will be sending my next box of photos next week. My husband's head is full of math research. He tends to forget other things over time. His memories of our incredible, five and a half week, European honeymoon were fading. For our anniversary, I wanted to scan our 1600 honeymoon photos. Since my husband works from home, I needed some help in keeping it a surprise. Bryan wrapped and shipped my prepaid box so that the company logo didn't give anything away. Now, my husband has daily reminders of wonderful memories as his screen saver. Now _he_ is the one saying, "Hey, remember when..." Thank you, Bryan, for all your help. Next, childhood memories for him and his siblings. I was getting ready to move oversees and couldn't not carry 10 lbs of pictures with me. ScanMyPhotos saved me. I loved the quick turnaround and now i don't have to worry about the extra weight!! Def will use them again in the future. Very impressed with the speed of service and the photos in general. Give it a go you won't regret it..
i loved telling your story in the book "Smart is the New Rich." congrats on the recent great reviews. WOW!!! Just got my 1000 pix back...less than a week turn around!!! Disc is awesome....easy and organized!!! I'm so excited to put some of these pix on FB and send to family and friends. I'm only sorry I didn't do this a LONG time ago...but better late than never. I HIGHLY recommend this service...no doubt it is unique and professional!!! On my recent vacation i shared my experience with scan my photos - telling everyone what a great company you are and what a great service you provide. I know there are alot of people who have never heard of you and i just want you to know how much you have help me "get it together". I never miss an opportunity to tell people about you. I bought a picture scanner thinking that I'd do that daunting task of digitizing my own photos. After listening to that humming scanner sound for an hour and realizing that I had only scanned 10 pictures with poor quality scans, I realized that it would take me days, weeks, maybe months to get 1000 photos scanned- and that's betting on my motivation not dwindling! I decided to be realistic and just sent my 1000 photos to scanmyphotos.com. They had the best price I've seen online. Sent them out cross country and got them back within 7 days. How amazing is that???? Great FB special, great quality scans. How did I ever think I was going to do this myself? So I went back to the mall and returned that picture scanner! I am very pleased with your service. I ordered 1000 photos a few days ago, and I couldn't believe how fast and good your service was. I got my CD and photos back in three days. @ScanMyPhotosare your ears ringing? @JeffreyHayzlett is talking about you at his @NATPE presentation. Hope you are well! Shameless promotion: Scanmyphotos.com is the coolest service EVER! Sent 1,000 4x6 photos out on Monday. Got them back on Friday! They look great -- fast and efficient service. If you are trying to figure out how to integrate digital images with paper, this is it! Check out their website... next up, Dad's slides! I can't wait to bring more of these images to light. We are amazed at the efficiency of ScanMyPhotos. Within exactly one week we mailed and received our order back. It was perfectly packaged when returned and all the photos were in perfect shape. We were able to track the return via USPS with an email and tracking number as they let us know when they shipped it back. The Index book we ordered is priceless along with the DVD's. We took advantage of the Facebook offer to scan 1000 photos, basically for free. Everything was handled in a timely and efficient manner and we are very pleased with ScanMyPhotos and their way of doing business. 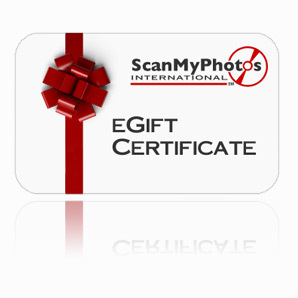 We highly recommend using ScanMyPhotos and their services. Thank you. Just got my photos and disk and they are fantastic! The quality was great, and I can't believe how fast I got them back. I am definitely going to tell all my friends about this company, and even see if I can get another 1,000 photos to send in. I just took advantage of ScanMyPhotos.com's Facebook offer to scan 1000 photos, basically for free. It's a pretty amazing offer and an equally amazing service. First of all you mail them away and 5 days later they're back in your care, which was terrific. And finally all those photos that had been sitting in albums unseen can be shared. That's the best. Thanks for your care with my photos and the quick and clearly reliable service! wrapping up very successful scanning project w/ @scanmyphotos. 22k photos scanned for a client--reduced to 12 disks! Received my box of 1000 photos back and they are all now backed up on disk...so excited and amazed by how quickly I got them back safe and sound! Thanks much! Thank you for your excellent service. I am so pleased with the results. I will let others know of ScanMyPhotos.com. The photo I sent you of the men standing by the boat I thought was non-restorable. I could not believe you could fix this print. Ever one I show it to is amazed. Many thanks. Cannot say enough good things about @scanmyphotos, they did an awesome job and are very very fast!!! HOLY CANNOLI!!!! I put my 700+ photos in the mail to you on Tuesday 4/6 & received them & my CD of scans back already TODAY... THURSDAY 4/8!!! I am so excited to spread the news of your EXCELLENT service and know many who need your abilities! Thank you so much for providing a much-needed service (at least in MY world ;-)). Wow! Just got my cd back from www.scanmyphotos.com 1,000 photos sent to them and returned as a cd in one week! That's topbox service! This was the best photo scanning experience I've ever had....quality work, affordable, and incredible customer service. Thank you for making a very difficult job bearable!! Incredible job -- you guys did fantastic work on a bunch of photos I sent a few weeks ago. I couldn't be happier with the results and now I know that if anything happens to the originals at least I have secure (backed-up!) copies! I have to tell you that the recent restoration that you did for me of my friend's sister is nothing short of amazing. Although I expected some significant improvement on what you were given to work with, I never dreamed that you would produce the quality of the restoration. It is absolutely awesome. In a previous email, you ask if you might use the picture as a before and after and I think that would be great, and encourage you to do so. Thanks for the quick turn around and great job! Very good customer service from ScanMyPhotos. They do a great job. Send in old prints and they send back CDs. Just got 3 boxes of photos back from@ScanMyPhotos Had every one of our old photos scanned to disc and love it. ScanMyPhotos.com just digitized 1600 photos almost flawlessly for me...incredible service! Right on! I'll have to stop in next time I'm in Irvine...family has had a blast since the DVD arrived...streaming onto Apple TV w/ tunes! I just received my order 799823 with 1871 scanned pictures and I'm thrilled! The scans turned out much better than expected. Thanks again for a fast and high quality job well done! I think I know what to get your mother for her birthday this year. https://www.scanmyphotos.com/photoscanning.html Shhh. Mitch - Thanks for the great customer service. Video montage looks great! Quick turnaround too. Had 1000 old prints scanned -- it was cheap, fast, great quality! Loved it, loved it, loved it. Sending more old prints soon! I received my DVDs with photo book today! My husband and I are very impressed with your expedient service. (We have more photos, and they will be on their way to your lab soon.) My husband was very skeptical about sending 'old and valuable' pictures to you thru the mail. Now, he feels he can. Thanks again. I'm impressed with your service. I'm going to be sending in an order soon!!! I recently sent in several boxes in your prepaid plan, and also sent in photos under one of your specials (facebook special). In all cases our photos were carefully scanned and quickly returned. The discs worked without fail (and quickly) making our transition to 100% photos on the computer very easy. I have told many friends and family members about your great service. Here's a shameless plug: scanmyphotos.com. Outstanding. Great service. my garage has never been cleaner. It took me close to two years to finally get that box your company sent over for me to fill up with photos and when I received the scanned results, I was amazed. The quality of the scans was excellent. My All-in-one printer with the built in scanner couldn't have done a better job. I now have the peace of mind that all my photos have been digitized and I can now put my photos away and share the scanned versions with family and friends. You guys have a great and affordable service and I can't thank you enough for helping me with this task. I was quite happy with my first box, which I received a few days ago and I just sent in two more boxes yesterday. I need another, hence this order. You do make it very easy. Thanks. You guys did an amazing job. As a professional photographer, I can be a bit picky, but the digital scans of my photos in your automated process still looked so good. I was GREATLY impressed by the job you did on my first. The Photobook was great and I'm extremely pleased with the scan quality. Thank you VERY much for doing what you said you would- A PROFESSIONAL JOB! I did have a great experience with your company! The scan quality is excellent and the service was very fast. I'm already looking for more photos to send you. I first read about scanmyphotos.com in a glowing article in the New York Times. It took me a while but I finally used this service and I could not have been more pleased with the results. I sent my photos by priority mail on a Wednesday, they received the package Friday and I got an e-mail that same Friday that my scanned photos were on their way back to me. I received the photos and the DVD on Monday. It could not have been any faster and the results could not have been better. I sent the photos from the first two years of my daughters' lives when we were still using a regular film camera. The scans were excellent quality, crisp and clean, and we are so happy to now have all of our kids' pictures digitally saved. I have already pulled down my old photo albums from college and I am eagerly readying another order to be sent to be scanned by scanmyphotos. Outstanding service and quality -- could not ask for anything more -- and now we'll have all of our photos safely saved forever. I'm going to save you some time: if you're like me and need to get a ton of prints in a digital format, so that you can share them with your friends, post them online or just simply manage them better, then I recommend sending them out to be scanned professionally. It cost me approximately $50.00 to have scanmyphotos.com scan my prints and send them back to me. The service did the job as advertised. Once I received my scanned photos from scanmyphotos.com, I simply imported my scanned images into Lightroom - it was a huge time saver. Yes, it's all about simplifying my world. So what happened to all those prints you ask? Well, they're in a shoe box collecting dust in my closet. However, their digital siblings are getting lots of play! Doing business with you is a pleasure. What responsiveness!!!! Just wanted to say thank you for outstanding service. I learned about ScanMyPhotos in an AARP magazine article a while ago, and I purchased the prepaid 3-box scanned photo service. The quality, speed, price and reliability of your service was outstanding and far exceeded my expectations. I will use your Company again, and have recommended it to several other people, as well. I am writing to tell you thank you for the awesome service that you provide. I can't believe how fast you were able to turn around my order. I put a recommendation on Facebook for your company. Thanks again for the excellent job! Keep up the great work! You guys did a great job and I will definitely use your services again, and I have been recommending you to everybody. I have no complaints at all. The pictures were returned very quickly and in the same condition as they were when I sent them. The DVD's were also great. Finally got a chance to look at my photos from @scanmyphotos ... AWESOME JOB!!! YAY!!! Highly recommended, fast, great service!!! I now have my life from the 70s & 80s digitally accessible. @ScanMyPhotos scanned 1700 pics to a DVD and sent it back to me in less than 7 days..
You always hear of something bad happening to someone else... until it hits you! I decided to send over 7,000 photographs to SCANMYPHOTOS .... over 70 years of my family history... to be scanned. All the photographs were professionally scanned and returned to me; three months before the fire destroyed my home. All my photographs were destroyed or damaged by fire, smoke or water - except for the DVD's in my fireproof safe that I had received from scanmyphotos.com. Not a single picture was lost that were on the DVD's and I can have quality prints restored for display in our home. I am so glad I had my photographs scanned when I did. Thank You! I received my first four boxes back with the disks and I am VERY HAPPY with	the results - and pleased with [ScanMyPhotos.com] and your quick and friendly service. Thank you! I have recommended you to many of my friends! (I receive your newsletter emails with updates, etc.). I ended up going with http://scanmyphotos.com/ which was SO worth it, and fantastic service. And $-wise, it was way less expensive than it would have been for me to spend literally dozens of hours scanning things. Great results @ScanMyPhotos. Had all my film photos scanned 2 preserve memories of kids & family. Great piece of mind. Fast. Low cost. Thx. I am nothing but impressed with the ease of the website, the fact that [I was] called to clarify my order, and the friendliness of [your] online chat. You guys rock! Scanmyphotos.com + Picasa Web Album face recognition = archiver's bliss. We are very pleased with the first two boxes of photos that we had scanned as part of our family generations package. .
After reading about you in the New York Times last August I ordered three photo boxes for you to scan. It took us a number of months to assemble the boxes with around 5000 prints however today we received back the final scanned box. We could not be more thrilled. Many of the photos were well over 70 years old, some in poorer condition then others. The scan job was fabulous. More recent pictures retained quality comparable to our newer digital prints, and the old material looks significantly better than it did previously. Scanmyphotos was courteous and the service extremely prompt. You all took great care of the pictures and went to the trouble to repack the boxes with the same care they were assembled with initially. I have no reservations strongly recommending your services to others. Please feel free to use us as a reference. In the never-ending quest to put everything that can be onto bits & bytes, I just had scanmyphotos.com digitize 800 pics. Organized = happy. Much obliged for your service - the first box of scanned pictures are now playing as a computer screensaver and neither my wife nor I can leave the room anymore. Just got my box of images back and I am beyond pleased with the results. Amazing. I had to write about it on the blog... check out the story here. What an amazing service you offer; can't wait to send my next box. Thanks and take care. I discovered the amazing SCAN MY PHOTOS. It is a service that will scan all of your photos for you and send them to you on DVD. How cool is that? Read more. I was really pleased with your prompt and quality service on the first two boxes and look forward to sending over the third. Thanks! Sent more than 2,200 print photographs to @scanmyphotos in their pre-paid box. Turned out to be about 5 cents/scan. Glad I did it. Number of pictures I fit into my @scanmyphotos prepaid box? More than 2,250. Came to about 5 cents a scan. Very cool. My latest round of digital photo scans is on it's way back from @scanmyphotos. Only one more box of pics and all my prints will be digital. We have been enjoying the two index bookssoooo much and the DVDs of our family photos!! Thank you, thank you. Again, many thanks for your wonderful service. My children have been sending photos of themselves when they were growing up to fellow friends, and even aunt and uncles. What a great service you provide! Great service, great quality...telling everyone I know about ScanMyPhotos! Thanks for helping me "clear my clutter." @lorane_: Scanmyphotos had a terrific turnaround. I had 984 pictures scanned. They look great - now to get them into order! It's not often someone as verbose as I finds herself at a loss for words, but the only one that comes to mind at the moment is "Wow." As in, Wow, that was fast. Wow, I love the index print book. Wow, two DVDs! Wow, it was so easy. Wow, I'm so happy to have all these old pictures in my computer. I already twittered about it. I couldn't help myself! This is a fantastic service and an amazing deal. I loved the frequent contact, too. All in all, a flawless experience. I am truly thrilled. Wow. @scanmyphotos did a great job with my pics. Super fast and great price! Thanks! I got some photos scanned there and loved the album you made. @scanmyphotos I just picked up the camera. It's awesome! Thank you so much! Can't wait to use it. Just wanted to let you know that I was very pleased with the results from my fill the box order. I sent the box from New Hampshire on a Monday, and had the order back to me the following Saturday. I'm very pleased with the quality of the images and will be placing an order for another box this week. I will be recommending your company to anybody I know of who wants to have bulk photo scanning. Great job and great service!! A huge THANK YOU for making this service available and affordable! @SandiHockeyMom check out scanmyphotos.com best thing I ever did! I just got the ScanMyPhotos package. Amazing. Your staff's scanning quality was fantastic, and the extras are greatly appreciated. This project is one of my gifts to my grandfather for his 80th birthday, and I know that he will be incredibly pleased with being able to browse and relive many years of great memories. And the hardcover bookis going to be the icing on the cake. I think I mentioned that I've already recommended your service to dozens of friends, colleagues, and acquaintances. Now that I've experienced the product firsthand, please know that I will certainly be recommending the service to dozens more. Last weekend, my wife and I bundled up about 1000 loose photos and sent them off to your company to get them scanned for posterity. After receiving my DVD and originals yesterday, I had to write. I could not be any more thrilled with the result. I spent hours last night reliving high school, college, graduate school and my post academic life in New York. When I shared the pictures with friends on Facebook and via Picasa, the reactions were magical. ScanMyPhotos.com does a great job on scanning old pictures. Just sent them over 5000 pics and they came back on a DVD looking great! @ScanMyPhotos y'all caught me ;-) thanks for the RT and great scanning services, too. I send everyone I know to y'all. I find the company and its staff wonderful and helpful when I had my 1,999 photos scanned last year. The job last year was absolutely great, as I am a very detailed and organized person. Plus I did photography since 1980. Now I am faced with thousands of slides, and I am learning the digital process and archiving. Quality is most important to me, and I find that your company provides a great service -- and a great staff. Thank you! You guys do great work. I think I set a record with 2100 scans in that box and it wasn't over-stuffed just tight. Thanks, I will be bringing you guys a ton of business, as it is related to mine--I do video and photography and archiving. I was extremely satisfied with your service and quality. I have referred and will continue to refer friends and family so they can recapture some of their past photos that, like mine, have been stored away for years. Several months ago I sent (3) boxes of photos to your company. Many of the old photos had no surviving negatives. I also sent about 8 years of photos taken of my kids in their younger years that were shot with a Instamatic 110 camera. Those negatives were curled and had turned to a bluish hue. All photos were scanned and returned within one week. They came out magnificent. I had copies made and they looked as good as the original. I always feared something would happen to my photos. Property can be replaced but photos of family and my children are priceless. I have a duplicate copy now stored at my brothers home. I can now rest peacefully knowing that the family history is preserved thanks to your invaluable service. You are all the greatest people. I believe a quick note of gratitude is in order! I am a recent customer of ScanMyPhotos.com and I couldn't be happier. I was excited about the Facebook discount; however, with many of my photos not fitting into the 4X6 range, I couldn't go with the free offer...................and yet, I have been telling everyone I know about your stellar service and I just finished a review / link for all my friends and (hopefully) their friends to check out. I didn't need free service to declare what is an absolute truth! Your service rocks! With a toddler and newborn, I desperately needed to get my photos in order before we added the (surely) thousands of more to come. Needless to say, though we own a scanner, I simply did not have the time to scan each one of my photos. It was a bit daunting to send my life's entire photo collection off to places unknown. It was a silly fear. Not only did your staff respond to my inquiry of receipt in record time, they did so in a kind and professional manner. The disc and photos were returned wonderfully packaged and lightening fast. To understate, the results are brilliant and very much worth every penny! Thank you so much for helping me preserve the images of my family's history. Thank you for a great quick job. My daughter and I are now working on some Power Point presentations to go with my speaking engagements. I am sure you will hear from us again. Thanks for scanning all my photos. You saved me so much time that I don't have available now with a family. Your speed was incredible. I am very pleased with the scanning of my lifetime of snapshots, and will have another big order on the way before long. I really wish I could give you some constructive criticism, but my order was flawless. I followed the instructions online, packaged it up as instructed and a couple weeks later I had my film canisters and photos back. Excellent service; flawless execution. Keep up whatever you're doing. I do want to give you feedback on my first experience with your company. I brought a box of photos of various sizes to be scanned. It was a Monday holiday and I didn't realize that the store was closing earlier than the normal time. I was told to come back in a couple of hours, which I did but the scans were not quite ready. It was not a problem. I told the person at the counter that I was going to go shopping across the street. A little while later I got a call from him, telling me that the scans were ready and did I realize the store was closing early. I told him I was stuck in bad traffic. His response was not to worry, he would wait for me. And he did. That was terrific service and I've given your company name and address to several others in my scrapbooking group who want to scan in heritage photos. And - my family is enjoying seeing all of the old photos on the disks I was able to give them. It was a great service. I've referred it to several friends. It's invaluable to have taken photos that were buried away in several boxes in the garage, unlikely to ever be viewed again and have them put onto my computer. Old friends have had many laughs when I sent them some old photos and the grandparents are thrilled. Thank you. Thank you. Very pleased. Working on my next order and have referred you to a friend. The service was excellent. I used you to scan all my photos so while I have no further need for your services, I have recommended you to many people. Good luck to you. I wanted to thank you and your staff. This project came about as a way to share over 30 years of photos with my extended family. One day I saw a great picture of my son, on the beach, with a boogy board. I didn't own the picture, but it had been sent to me by my sister-in-law. It then dawned on me that I had many, many pictures of family members that they, the object of the photo, did not have. This was my way of giving back to my family these unseen and unappreciated photos. Your staff helped to bring this about. They were professional, courteous and quite helpful when I had a question that required an answer. This was a wonderful experience and I have told many of my friends and family about this wonderful service. Thank you and thanks to your staff. it was a good experience and I am now gathering more photos for Scan My Photo. I was very pleased! I'll give you a quick reply, just for information purposes. I read about your services in an internet article and after doing some research used you guys based on price and years of experience. I'd say I got exactly what I expected, with a great price. I didn't realize I had that many pictures, nearly 2700 I think, so I should have gone with the box, but maybe they all wouldn't have fit, don't know. The quality of the pictures is good, but not great, but then again my own experience with scanning in photos is about the same. For the majority of the pictures it doesn't matter, just reviewing them on the computer. I have a set of pictures from a trip to Switzerland that I wanted to view on my big screen TV, so after selecting a pretty large subset of those 200+ pictures, I cropped a lot of them and then spent some time on each one working the colors and contrast via Adobe Illustrator, which may or may not be the best tool to use, but I have it and it works. It seemed that most of them could use either a color tweak (more green), some enhanced contrast, and/or a sharpness increase. I haven't viewed them on the big screen yet, but they look much better on my 17" LCD computer monitor. So thanks for the work, fast turn around (a friend actually drive down there with his 5000+ pictures, his Mom wouldn't let him send them all! ), and good quality. I want you to know how satisfied I was with your service. Its a little unnerving packing up a lifetime of photos and shipping them off to a company, but it was totally worth it. The price was incredible, the turnaround time was ridiculously fast, and the quality was better than I expected. Some of the photos those my father had taken over 30 years ago, of family I've never met. As he's gone now, I thought I'd never know who the people in the photos were. By posting them online, I now have family around the world (literally!) able to fill in the blanks for me! Maybe that's more than you wanted to know, but its meant a lot to me to get these photos online - your service made it possible. Everything was awesome and told my whole family to send old photos to be scanned. I now view the pictures on the Samsung 46 LCD using Apple TV. I found your company on the Experian Cheetamail intranet. The manager on duty even opened the door for my girlfriend last minute after I called. He put in that extra effort for the customer. Please thank him again for saving my girlfriend a trip. I have placed 2 orders through you (so far) and each has been a wonderful experience. I will definitely use you again and recommend you to my friends. Thank you! I was quite impressed with your services. Your service provided me with a solution to a problem that was frustrating me. I was so impressed that I have recommended you to several of my friends and family. Honestly, the photos on the disk look better than the originals. I just got rid of three huge shoeboxes and am so happy about it!!! I would totally use your service again and have recommended it. I just got my order back and Loved everything about the job you did. I am recommending it to my friends as the easy affordable way to save your photos. I am looking thru my closet to find thousands of other photos that I will send you. I see you have promotions from time to time, I will wait for them. Thank you. Wonderful service. Safe and Secure. Little apprehensive earlier but the service was very good. Would be very helpful If an email is sent out during each stage of the transaction to re assure sender. [note, the entire order is received, processed, scanned and mailed back within 4 to 8 weeks, so only one confirmation email is provided]. Will recommend the service to my friends. Thanks so much, and I appreciate very much that you folks went the extra mile to get my the 3 DVD copies over and above my first one. I am amazed at the quality of the scanning service and I've moved all the photos into iPhoto, where I can organize and manipulate and document them. As soon as I get a large number of photos from my brother, I intend to put in another large order for almost 2,000 scans. It's been a pleasure working with Cesar. Thank you - the package was successfully and safely delivered and the scans are terrific! Schweet! You guys are great. Not only is your price right, and you offered to add the ones I missed, but I wasn't expecting an answer for at least a day, much less in minutes. You've got a happy, referring customer. You guys rock. You once again EXCEEDED my expectations. I have no reservations recommending your business to my friends and family. Best wishes for a prosperous 2009. The service was so extremely fast, the communication from Scanmyphotos.com was great. I've very happy to have found your service and will absolutely tell people about it. Not to mention the price is very very reasonable. Lastly, the free M&M's was a really nice unexpected touch. Thanks again so much, happy holidays! I got my [ScanMyPhotos.com] order last Friday as usual everything was in order and the disc contained all my photos. Thank you so much for shipping my order FedEx so I could track it's progress back to me it was a great personal touch. Again I love the quality of your work and your service! Again Thanks a million. It's been wonderful doing business with you!! Y'all did a fantastic job scanning my photos! Thank you so much! Unfortunately, (or in my case, fortunately) the photos you have laying around your house pre-digi cam and pre-selfies are usually one of a kind. If you lose it, use it in a project, burn it in a seance, etc., it is gone forever. Ideally, you would like to scan every single one of your photos from your 8th grade field trip when you finally held hands with Benjamin. But that takes forever and stalking on Facebook wins out every single time. Thankfully, this genius company will do all the labor for you. Sure it's a little disconcerting to send every single hard copy you have away, but it's well worth it. Every single photo comes back to you plus a disc with every single photo scanned. Now that 4th grade picture of you as a not-so-little kid will be around FOREVER. Case in point: that lovely picture of me to the right [see blog]. That my brother got scanned. Then loaded onto Facebook. And tagged me in it. Special. I think your services ROCK! A few months ago I decided I would start archiving my parents life - a lifetime of photos sitting in shoe boxes that no one could enjoy. Thanks to your awesome, professional, and SUPER FAST scanning services, I was able to organize 12,000 PLUS photos and now can share them with family and friends! www.thepaulfamily.info has brought those pictures to life and thanks to Scan My Photos, I was able to get this seemingly impossible project finished for everyone to enjoy! So my special gift I ordered for my husband for Christmas arrived and it is SO COOL! I had all of our old photos scanned (ones that were taken pre-digital camera). And ScanMyPhotos.com did the best job (seriously amazing customer service)! I shipped them thousands of photos and within 4 to 8 weeks they had them all scanned and sent back to me with a book chronicling each picture. The best part is you can put the disk in your DVD player and watch it on TV as a slide show. That is fun when all the family gets together for the holidays so it was really a gift for us all!. Definitely worth checking out. And you still have time! I love your company's service so far and plan to send you more work! You did a great job filling my last order. Thank you and I look forward to dealing with you in the future. I don't usually write letters such as this but I am very impressed with your service and the quality of your work. I have had 2 boxes (with close to 2,000 photos per box) scanned by your service and the results are amazing. We live in the San Diego area of California that was affected by last year's wildfires. Several of our friends lost their homes due to the fires, and the greatest regret to them was the loss of their family photos. Their family snapshots and photos are perhaps the one material item that is truly irreplaceable. Over the past 30 years we have accumulated thousands of precious photos. When we evacuated our home due to encroaching fires last year, we were only able to grab a handful of these photos. Luckily, our home was spared, but we resolved to somehow preserve our photos. When I first heard of your service, I was a bit skeptical but after a little bit of research I felt that the scanning service you offer might be a good way to keep our photos safe. My wife and I actually enjoyed going through our numerous boxes of photos and selecting what we considered the best 5000. We shipped them to you and in less than a week we received our boxes back along with the DVD of the scanned images. The quality is great and we have already shared electronic copies of some of the photos with family and friends. We are encouraging all of our friends to check out your service. Thank you for a job well done. I just received my first delivery of DVDs with your very nice, Dear Friend, telling how much you and your staff appreciate the opportunity to preserve my photos. Excellent customer relations. (I am the former CEO of Bergdorf Goodman and do appreciate good customer relations and service). Since we both know satisfied customers bring about the required sales and profits necessary for a business to be successful. The attached message from my youngest daughter proves your great success. I thought you would like to see it. What a great job you guys do! I filled my box with over 2000 (!) photos, and many of the electronic versions of the photos look as good as the ones that I take on my digital camera! I've still got at least 1500 more old photos, and I'm putting in my next order today. Unlike the new Miller Beer "Miller 64" containing only 64 calories, YOU ARE GOING TO MAKE IT! I have never had a more enjoyable experience. Your company is everything it promised to be. I am satisfied beyond words! From your employee(s), I had questions for before I sent in my order for over 700 photos, right down to your finished product, I am EXTREMELY HAPPY! Especially when I read about the poor lady who had a leak in her attic and destroyed a lifetime of photos. Now, I have no worry whatsoever about this happening to me. I am ESPECIALLY (capital letters indicates shouting, enthusiasm) proud of the 8.5x11 album you sent me containing all my pictures. This makes it SO easy to look through, find the photo by the number beneath it, bring it up on the computer, then e-mail or print it. What a service! What a price! You can give my name and this note to anyone and have them call me anytime! Well, I guess you get the gist of my message. I am totally happy with your price, your service, and your finished product! ESPECIALLY (I think I used that word before) the album. I received my order, and I am extremely happy. I'm packaging another 2000 photos to send you. I have five more boxes to send to you for scanning over the next month! Hopefully, I'll keep it simple and correct. You have a great service and do it well. Keep up the good work! We referred a customer to you last week and I just received a call thanking me for sending them to such a great place. You could tell with the excitement in his conversation that he was more than pleased with the job you did for him. I don't know all the details, but I just wanted you to know that he actually called me and told me the great job you did. Just a note to tell you I'm ABSOLUTELY DELIGHTED with your service. The results were exactly as advertised and the service was quick and efficient. I recommend you to anyone. Thank you so much for this great service. The pictures came out great. I am telling everybody that they should do this as soon as they can. You never know what can happen, fire ,flood, natural disaster, etc . To know that your life's memories can be stored safely in such a little space is wonderful . Also could not believe how quick the turnaround was. Literally round trip across the country in 5 days. Thank you for the follow-up email and for the excellent service. It's very refreshing to find a company that still puts an emphasis on their customers and the experience that they have. I was extremely pleased with my order, both in the quality of the job done and in the (what has to be a record) time that it took for the entire process. Because of your service, I have been able to share the more than 800 photos that were scanned with my friends and family via the internet. Photos that haven't seen the light of day in years are now being enjoyed by people that I haven't seen in a long time and being used as a contact point for us to reconnect. While this was not my initial goal, I merely wanted the photos preserved, it is an extremely welcome side effect! We just got our first box back today (my mom's). And we LOVE It! Thanks so much. The quality is impeccable! I'm motivated to go pull the photos for my box now! Below is my review, which I also gave orally at my geneallgy class today: Family Tree magazine had recently sent out an e-mail about a promotion by ScanMyPhotos.com by which one could send in up to 1,000 4x6 prints for scanning just for the $20 cost of return shipping. I got this note only a few days before the Feb 29 deadline, however, and my wife and I didn't have time to plunge into our huge stash of prints to put together a box of photos we'd like scanned. But I did have four rolls of prints from my family-history trip through Alabama a few years ago that I did want to use on a genealogy website. And since it would be at least 6 months (i.e. post-remodling) before we're likely to get a home scanner, I decided to package them up and try it. I still had the negatives, so there was little to lose even if it was a diaster and the high-speed scanner chewed up my photos. I mailed the photos Thursday afternoon, got an e-mail Saturday night from the Irvine, Calif., company that my order had been processed, and on my porch this afternoon (Monday) were my prints. I couldn't be happier with the results. All the 93 prints were in fine shape, and the scans on the disk were as sharp as the photos and about 1.5-2 MBytes each, not a 30kb thumbnail that I feared they might be. Absolutely fabulous. They even posted them on they're own Flickr-like site ... to make it easy to buy prints, cards and other projects, to be sure, but also easier for others to see, too. On top of that, there was a large Nestle's Crunch bar (unbroken) in the package, too. (Perhaps that is a cheap, but delightful, damage detector?) In short, I could not be happier with the ScanMyPhotos service. Normally, the 1,000-print scan costs something like $100 dollars -- and for that they do handle a variety of photo sizes. (But they do have very specific packaging and photo-ordering instructions on their website that must be followed for you to get the exepcted scans.) Two thumbs up ... WAY up for ScanMyPhotos.com and that Family Tree Magazine promotion. I was one of the women who attended the Moms Group fundraiser event [at 30 Minute Photos Etc and ScanMyPhotos.com which raised nearly $1000.00, see link for info on how we can host an event for your non-profit group]. As for the fundraiser itself -- it was awesome!!! What a practical and enjoyable way for our group to raise money. Thank you for the wonderful wine, food, and other refreshments. Your entire staff was incredibly patient, helpful, friendly, and quite cheerful considering we probably kept some of them there past closing time. That kind of atmosphere and service is really what sets you apart from other places. I'm pretty sure our group will be coming back for another fundraiser. I wanted to say thank you for preserving all of our old pictures and putting them on a dvd. I am loading them all onto an Ipod for my wife for Christmas. This process was going to cost into the thousand dollar range with other providers and you did a better job for much much less! I can't wait to see her face when she sees 20 years of pictures all captured digitally!! The turnaround time was amazing - I can't beleive you got the pictures shipped out the same day. I received today my photos, the books and the dvds. I think you and your people do amazing work. I am so pleased...and relieved to have these photos put into more usable formats I mailed off box 3 today. And I have started work on box 4. (counting the first one which wasn't one of the prepaids.) Thanks for personally keeping up with things. Pardon my bad manners for not acknowledging receipt of the wonderful photo album and enhanced disk. I really appreciate it. I am gathering more photos to send to you and I've told everyone about your great service. You have no idea how happy I am to have found your company. Scanning my photos has been on my to-do list for years. Now I can rest easy knowing that if the house burned down and I lost all my photo albums, I have a disk of all the photos in the safe deposit box. Thank you so much! I will be ordering with you again - very shortly - this service is terrific! I do think that you did a great job on our pictures and everything came back in the order that I sent them. I will share the DVD's with our children and grandchildren. This will be my fifth and last box of pictures. I am so very pleased with the way you have treated my pictures and I love the CDs. I come from a big family and have passed on your services so they can use them too. Iowa, Illinois and Wash D.C. ... They too will use your company. Thanks again and I'm looking at many slides, so I'll see you again I know. I have received the package and in record time! I am really pleased with all the photos - the quality is excellent and I think it was well worth it. I was a bit apprehensive about sending off all my old photos (perhaps never to be seen again) but you guys got them back to me before I really even had a chance to worry about them. I just wish I had not been in such a hurry and that I had more time to pull together more photos to send off. Thanks very much and I especially appreciated that there was a real person on the other end who replied to my e-mails and made me comfortable doing business with your company. I have already told my friends and it wouldn't surprise me if you got a few more orders from Arctic Canada. I'm so excited to have more than 1300 "new" photos to digi scrap with! I would wholeheartedly recommend this service! And a note to my Mom... You NEED to do this because then I will have thousands more photos to play with! That was so fast. It is unbelievable to me that my pictures were in Texas yesterday afternoon and you have them done already. I will certainly spread the word to all I know - you all are AWESOME! Thank you also for taking the special time to send me this email update. Your promptness means a lot. I received the pictures back and they look fantastic. I especially appreciate the photo book and will get online to check out the pictures. I was very impressed with your service and how you sent it back - and a Starbucks card - now that was a nice surprise. I'll definitely use ScanMyPhotos again and will tell friends. Thanks so much and congrats on expanding internationally - that's fantastic! I had the pleasant experience of using ScanMyPhotos.com recently. About 2,500 of my photos quickly came back digitized - a wonderful service! Thank you again for your fine services. Thanks for scanning my pictures, and I also wanted to say congratulations for the pioneering of your product... The process could not have been any easier. [ScanMyPhotos.com] What a great job you guys do! I filled my box with over 2000 (!) photos, and many of the electronic versions of the photos look as good as the ones that I take on my digital camera! I've still got at least 1500 more old photos, and I'm putting in my next order today. What a great service! As a subscriber to the WSJ your recent article on companies that provide mail order photo scanning prompted a visit to our attic where many old family pictures have been hibernating for years. After tossing out more than 2000 images I sent a manageable 1800 photos off to scanMyPhotos.com in their prepaid box. It took only one week to turn around the process and have a disc in my hand for viewing. The scanned images look great on our TV -- except they reminded us when our hair was darker and our suit size was a perfect 40 ... the price of age and retirement! Thanks for the article that provided the incentive to do something about our old photos. Keep up the good journalism! I just wanted to tell you what a wonderful customer experience I had in your store this weekend. The pictures turned out great and I have told a bunch of my friends and colleagues who had no idea that it was possible to digitize so many pictures so fast. I suspect you are going to get quite a few people to come through your door from my referral. Thanks again... it's so nice to finally patronize a business where service really matters. Thanks for converting those family photos from my grandmother yesterday. The pictures turned out great. Mitch and his company did a great job in converting my old family photos that I inherited from my grandmother into digital images! My parents and family loved them. Now, we'll be able to share these photos amongst all of the grandchildren. After reading this article, I said to my wife this is too good to be true for the price quoted. I called and spoke to Mr. Mitch Goldstone at 30 Minute Photo. I liked what he had to say. I then purchased seven photo boxes, and chronologically sorted these in quantities of 1000 per box. I ultimately sent three orders to 30 Minute Photo e.g. ; 3000, 2000, 2000. For each order I enclosed written instructions e.g. Box #1,scan front of box to rear of box, etc. As soon as 30 Minute Photo received my order, I received an e mail stating that my order had been received. About two hours later, I received another e mail stating that my order of 3000 photos had been scanned and they were on there way back to me. What I received was my photos that were sent back in the same box, and same chronological order that I sent. In addition to this, I received CDs with 500 Jpeg files per disc. I have subsequently uploaded these to my computer, and have renamed files, and make backup copies. I have viewed these on my computer, and television as a slide show. The quality of the scan is excellent. Mitch states that they are scanned at least 300DPI. I am impressed with the quality of the scan, as well as the service provided by 30 Minute Photo. I would highly recommend this service that was provided. My wife has a plethora of photos that at some point in time will be scanned. I got home today, after one of those days that seem to happen more frequently these days, and went to check the mailbox. What did I find but the photos that I ordered for printing on Saturday! Today is Monday! I couldn't believe it. I was sure that you had sent me someone else's photos by mistake. But alas, they are mine. I can't get over the speedy delivery. Thank you. I will definitely be using your services again and putting in a plug with all my friends. I not only was surprised that the photos arrived there so quickly, but was even more surprised by how quickly you got them into your processing queue and proceeded with the order. I also appreciate the communication about progress. Your service for prints of multiple sizes seemed like an incredible bargain and I'm looking forward to seeing the results and being able to manipulate those electronic files. There are a lot of companies who will not deliver to APO's [military addresses overseas]. So when we find someone who is willing to it means a lot. We look forward to seeing our wedding pictures. Thank you so much! Just wanted to thank you for the great package of photos you gave to me and my fiancee. She just showed them to me, and we love them!! It's going for a beautiful video montage of photos for our wedding . You guys did such a great job. Joelle told me she really enjoyed talking to you the other day; thank you for the nice words you had to say about me. Thank you the $5 Starbuck's gift card; now I see what you were saying in our interview about those nice little perks to stick in customers' orders -- they really do make a customer feel good. Most of all, this photo scanning order we did with you truly brings home , on a personal level, what you were saying about providing memories: It's really true about how priceless photos are for a family. For example, my soon-to-be mother-in-law just had those photos sitting around for 40 years and no one was ever going to see them; now that we have had them scanned, it will be the greatest gift of joy for both of our families. Thanks so much for doing this! I have yet to find any other business (with the exception of In-N-Out Burger) that equals your great customer service. This is a huge help to me and I'm sure the prints will result in a couple of great Christmas gifts! Thanks again! Thank you 30minphoto.com for the excellent quality and speedy delivery of my printed photos. I also received thirty "Season Greetings" photo cards of the group photo of my military co-workers at no charge. I will defiantly refer my family and friends to you for all of their digital photo printing needs. Hi! even though it's 90 degrees here in NY, I'm thinking about our Christmas cards! We've had your company do our cards for the last two years, and we have been very pleased with your service and with the quality of the cards. I love love love your site. You always do such an exceptional job with my pictures and I love the quality and the service I get from you guys. I will forever be a customer and refer everyone I can!! You guys are amazing!!! All the Staff at 30Minute Photos, I want to thank everyone for the excellent service I've gotten the last few times I sent files via the web for development. I send my files on a Tuesday and by Friday the photos are in my mailbox (and I live in Pennsylvania). I wanted to extend my thanks in writing because so often in todays environment these things are left unsaid. I will continue to do business with this awesome company and have passed on this website to all my friends and family. Dear folks at 30 Minute Photos: Just wanted to share with you some news... I submitted two photographs processed by you to this year's New York State Fair photography competition. One of my entries earned an "Honorable Mention" in its class, and the other earned... get ready... FIRST PLACE! Actually, you folks have processed quite a few of my images, including the two I entered to last year's NY State Fair... both of which earned "honorable mentions." Thanks for doing a great job with your digital processing, and for having such reasonable prices, too!! Many thanks to you all for such a fast shipment and high quality photos! Many thanks too for giving us all a military discount. We certainly appreciate the positive support from folks like you! It was a true pleasure to do business with you and I hope for many years to come too! 30 Minute Photos Etc. is EXCELLENT. Their work is great, they are VERY fast (i usually have my prints in about 3 days...& i live on the east coast. (i think they are in California). Their customer service can't be beat. I had a damaged order - they reprinted the ENTIRE order...no questions asked & i had it also within 3 days. I used your services for the first time, last week, when I uploaded my Mother's doctoral degree graduation pictures. I had the pictures delivered directly to her so I was a bit apprehensive about what they would look like (quality, etc.). When my Mom received the pictures she was THRILLED at the quality and size of the pictures. And I was thrilled at the speed in which she received them. Well, a day later I received your "thank you for your order card" with the picture I'd uploaded for you develop on it and was just in awe at how good that looked. So, just yesterday, I decided that I would upload my sister's business card to have it printed by 30minphotos.com. Instead of "business cards" I thought it would be great to have "business pictures" printed. As I mentioned I placed my order yesterday and received the photos today! I was in awe, not only of the speed of getting them, but they are absolutely fabulous! I really think they are going to be a great part in the success of my sister's new business! I just wanted to let you know that 30MINPHOTOS.COM ROCKS! I can't ever seeing myself printing out another picture, and definitely not having my digitals developed anywhere else. YOU CAN COUNT ON A CUSTOMER FOR LIFE IN ME and I will refer all my friends to you, for sure! I'll have another order in July after the birth of my new baby! These are going to be the most gorgeous birth announcements ever developed! One last thing, on behalf of my husband who is a US Naval Officer and all the other military spouses and families, thank you, sincerely, for the military discount! It means a great deal! Thank you, so much! The service we receive from your company is great! We have been extremely happy with everything you have done for us!I have told many people about your services! I was *blown away* by the turnaround time to delivery on my last order!!!! Nice to do business with you. Very effective. Very responsive. I hope you don't mind, but I sent your last email about FedEx to friends at the ocbizjournal, and suggested they write you up, at any rate, if it comes to pass, great, eh? As usual, fantastic service! Extremely quick turnaround, super high quality and excellent selection of photo card backgrounds. I got the photos today, they look great, thank you very much. You have a gold mind with this company. Thanks again, I plan on using you again soon. I personally am a huge photography freak and ever since I got my digital and had my children, I take pictures all the time. Usually I print them myself, but I was very impressed with [your] quality. "I just thought I'd share this comment that I received from a 'soccer mom'. 'Okay, I love 30 Minute Photos Etc. I just got everything printed out and I could zoom in, center again, etc...I just bought a digital camera and am going to experiment with the kids' Christmas picture tonight. Thanks, Sheila. I shoot the home soccer games for her son's HS team and Sheila needed a place to not only get her prints, but she need a little hand holding, since she is new to digital photography. It's nice that your customer service make me look good :-)"
Thank you! You probably don't remember, but I tried to use your lab when I first went digital and kept having problems with the upload....so I ventured out to other labs, and unhappy with their quality, I tried you guys again. and I am so glad I did. I haven't had any problems at all and your customer service cant be beat, that is for sure. (starbucks giftcard?? hello!). I am a designer for an online scrapbooking website www.twopeasinabucket.com, (the number one scrapbooking site on the web) and women are constantly asking me about my photos and where I get them developed. so be prepared for an onslaught of orders next time someone asks me. I will definitely point them to you. 30 Minute Photos is the best! In addition to outstanding customer service and product of the highest caliber, 30 Minute Photos supports the community and so many wonderful causes. 30 Minute Photos has shown time and again that it stands behind the goal of the American Cancer Society to make the disease a thing of the past. LaVon Kibodeaux, American Cancer Society, Orange County, CA. My sister in Newport Beach was using your online service and turned me onto it even though I'm in Chicago. Very, very good service guys.